Cork, 3 April 2017: Minister for Housing, Planning, Local Government and Community Simon Coveney, T.D. 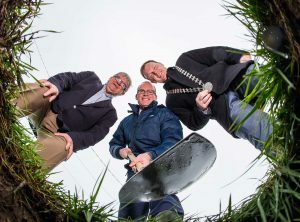 performed the official turning of the sod today (Monday) at Janeville, a new housing development worth €300 million in Carrigaline, Co. Cork. Astra Construction Services are building 800 homes on the 100-acre site, ideally situated on the Cork road before Carrigaline town. One of the most significant developments in the county, Janeville will comprise 3, 4 and 5 bedroom, BER A rated, detached and semi-detached homes which will be built in a number of phases. More than 100 people will be employed in the construction of Janeville and work on the first phase of housing is commencing immediately with houses already for sale off the plans. Since 1985, Astra Construction Services, led by Director Stephen McCarthy, has developed more than 2,000 houses in Carrigaline, including Herons Wood and Forest Hills. “Having survived challenging times in the construction sector, we are delighted to be starting this new development which will provide beautiful, high quality homes to families and individuals of all ages. We have always developed in Carrigaline as it is a great place to live with the best of both urban and rural amenities and facilities on the doorstep,” said Stephen McCarthy, Managing Director, Astra Construction Services. “Cork County Council has set out the vision of a number of Masterplan sites in Cork County over recent years. It is welcome that an initial phase of construction is about to commence on the Shannonpark Masterplan site. The new housing is clearly badly needed in the Carrigaline area and it is also vital that this is accompanied with infrastructural improvements as detailed in the Masterplan,” said the Mayor of the County of Cork Seamus McGrath. Home available in the current development phase at Janeville range from €290,000 (3 Bedroom semi-detached) to €495,000 (5 bedroom detached). Dan Howard Auctioneers are the appointed agents for Janeville homes, which have been designed by PLM Architects. Established in 1985 by Stephen McCarthy, Astra Construction Services has built over 2,000 homes in Carrigaline including Forest Hills and Heron Wood. Over the 25 years in business, Astra Construction has earned a reputation for high quality workmanship and building finish. The 100 acre site for Janeville was purchased by Astra Construction Services in 2004 and this new development represents the largest project undertaken by the company to date.